Have you ever peered into the steam coming off a piping hot delivery pizza and thought to yourself, "Oh, man, I wish I could eat the box, too"? No? We haven't either. 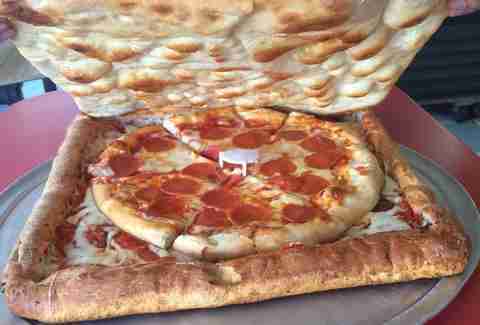 But it turns out a Brooklyn-based pizzeria has taken the problem that you've never had and created a solution: a pizza that comes served in a box made out of pizza. It's equal parts beautiful and totally insane and we want one. 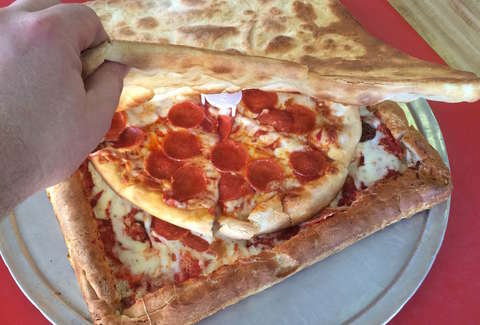 Vinnie's Pizzeria, the same marinara maniacs that unleashed pizza topped with smaller pieces of pizza last summer, first revealed the literally cheesy creation on Instagram, saying it's totally edible and therefore good for the environment. "No waste, as it is all 100% pizza and 100% delicious," the post states. "No more pizza boxes cluttering up your fridge or trash. Totally PIEodegradable." Obviously, the so-called Pizza Box Pizza inspires more questions than a pizza should: How the hell will they deliver it? How does it all stay together? Where would you even begin to eat it? We called its creator and Vinnie's co-Owner, Sean Berthiaume, to find out. As you can imagine, it took a bit of trial and error to make a Pizza Box Pizza that was structurally sound. Berthiaume explains that it's more than just folding a Sicilian pizza and shoving another pie inside. "The actual box itself is like a Sicilian dough and I kind of scoop it out and push it down to form a container," he said. "Then i have to construct the lid, which is almost the hardest part, I’d say, because it needs to be able to fit right on top of that and you can’t really have cheese falling off the lid that opens. I made sort of a garlic-y olive oil top that's almost like a garlic bread. Then you make the small pizza that goes inside." Yes, that's a lot of pizza, and it comes with a price tag to match: $40, depending on how you customize it with toppings. But perhaps the biggest question lies in how Vinnie's will manage to deliver the thing without it being soiled by the not-so-delicious elements of New York City. Berthiaume admits there are "definitely some kinks to work out," but said they'd likely transport it on a tray. As for eating it, Berthiaume said that's open for interpretation. "If you want to have a piece of the little pizza, that’s fine," he said. "If you want to rip off some of the pizza box, do what you want." Oh, believe us, we will. Tony Merevick is Cities News Editor at Thrillist and wonders if he can get an order of hot wings served in a pizza box. Send news tips to news@thrillist.com and follow him on Twitter @tonymerevick.